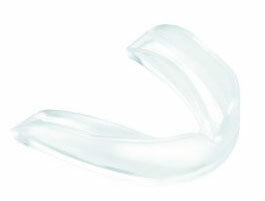 Protect your teeth during martial arts training or competition with this clear mouthpiece. It can be shaped after immersion in hot water, then rendered firm again by quenching in cold water. Mouthpiece also comes with a colored case.